There is something quintessentially British about the pie. In any poll of favourite British foods, some form of pie is sure to be near the top of the list. I am a sucker for a tasty pie as much as the next person. From a no-nonsense steak and kidney pie with a huge puff pastry crown to a traditional Melton Mowbray pork pie in hot water crust pastry; from a comforting cottage pie with its topping of creamy mash to an autumnal blackberry and apple pie smothered in lashings of rich custard, the perfect British pie in all its guises is like a warm hug in a dish. In celebration of British Pie Week (3-9 March), West Sussex based pie-makers Higgidy are hosting a Pie Party and you are invited! 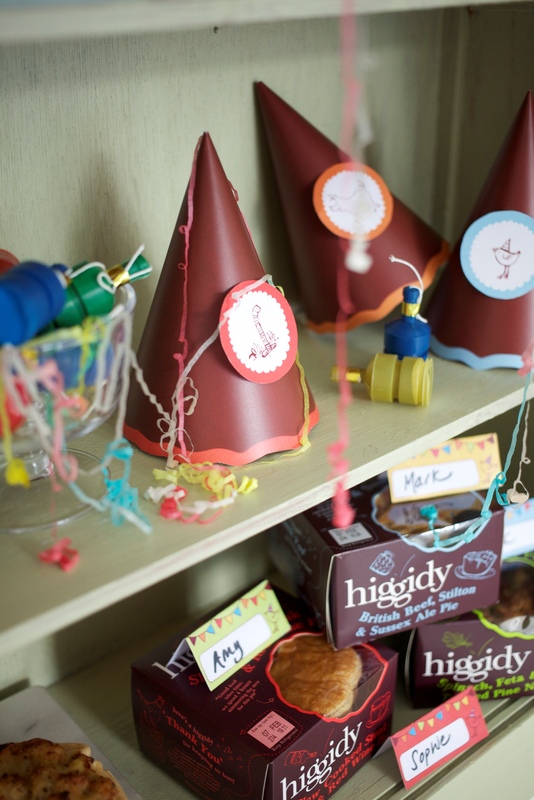 I have one special Higgidy Pie Party pack to give away, with everything you need for a pie-themed party. I am rather partial to a Higgidy pie – I reckon they taste as good as homemade, if not better. They freshly bake their pies by hand every day, and fill them with delicious ingredients just like you or I would use in our own kitchens. 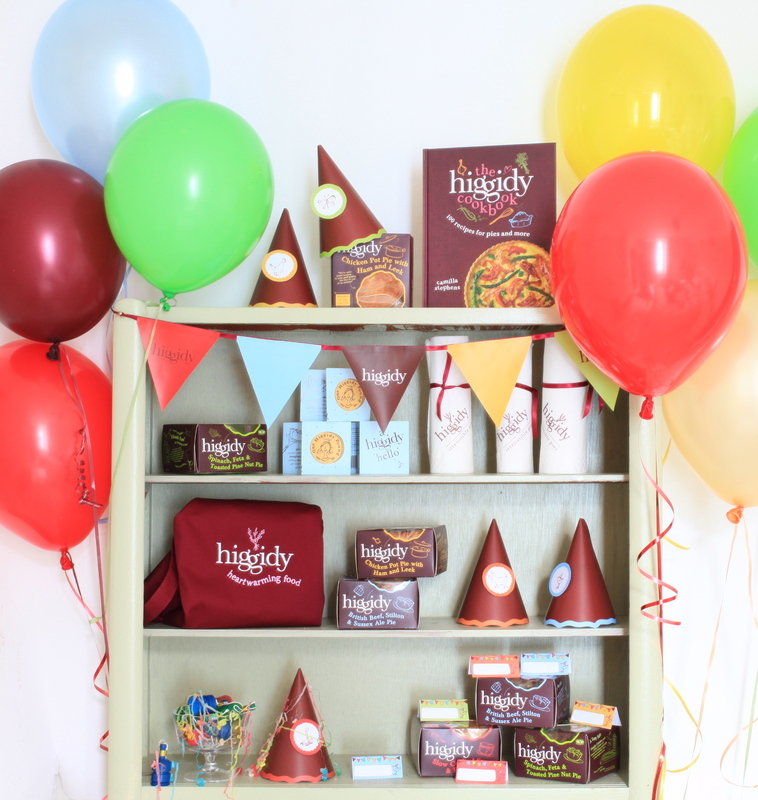 To win a Higgidy Pie Party pack, simply leave a comment below by Tuesday 25 February, letting me know your all-time favourite pie. The party pack contains party hats, balloons, place cards, and of course, enough meat and vegetarian pies for 12 to enjoy for dinner (or lunch if you’d prefer). What better excuse to get some friends round to share a home-cooked meal, and celebrate the humble but oh so heavenly pie? Closing date is Tuesday 25 February 2014. I am partial to a roasted vegetable pie.My OH is a pie lover and he would be extremely happy to get this. My favourite pie was a steak, shrimp and prawn pie, that I had many years ago when I was on holiday, it was so tasty I still remember it today. A ‘surf and turf’ wrapped in gorgeous pastry with lovely tender beef that just melted in your mouth. My favourite pie is a Chicken and Tangle Ham pie. Tangle Ham being ham hock! I love to fill it with veggies like leeks and asparagus or whatever is in season. If I’m feeling virtuous it works well with filo too! I love spicy lamb pie. Love the idea of a pie party. I loved the buffalo and kidney pie I just made, but my favourite has to be chicken and mushroom – using leftover roast chicken, stock from the carcass, chestnut mushrooms and a little cream, yum. I love love love chicken and vegetable pies. Favourite pie is chicken and leek pie, yummy! Higgidy’s Spinach and Feta wins! But if I were to make my own it would be chicken and chorizo with some chilli! Do I really have to pick a favourite because I love pies! For this comment I shall declare my favourite as Balti Pie! I love higgidy pies. Oh I could happily tuck into one right now. Maybe it’s time for dinner. Maybe it’s the anglophile in my American self, but I really love savory pies. And names like higgidy pies. They just make me happy. Good old fashioned chicken pie. Steak, Mushroom and Stilton. But to be honest it’s a close call, I love ALL pies! …and I meant to say I’m so loving the idea of a Pie Party, that would certainly make me popular with my new neighbours here in Herefordshire!